In the car, the air quality is at question as there are suspended particulates matters such as dust, pollen, harmful gasses, bacteria and viruses. More, there is smoke and new car smell that would put the health of your family and yourself at risk. 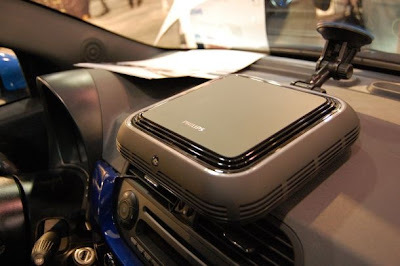 With Philips GoPure Automotive Clean Air System, the situation shall be improved significantly. Philips with its superior 3-stage filtering technology helps to quickly remove and reduce the pollutants and the odors to ensure healthy air on the go. It captures big particles like human hair and pet hair. It removes 99.9% of fine particles as small as 0.3 μm like airborne microorganisms, airborne bacteria, airborne viruses, dust and pollen. It is highly effective to remove bad odors like smoke, and decontaminates the air from chemical pollutants and harmful gases, such as formaldehyde, benzene, toluene and volatile organic compound.